Euka II wants to know if you’ll be her valentine. Aww, that’s sweet. But she also wants to know if she can get off this frozen chair. She’s losing feeling in her nether regions. It’s 29 degrees on this winter morn. The metal lawn chair is glittery with a coating of frost. And Euka II is sitting nicely while wearing her Eukanuba pink scarf like a rock star. 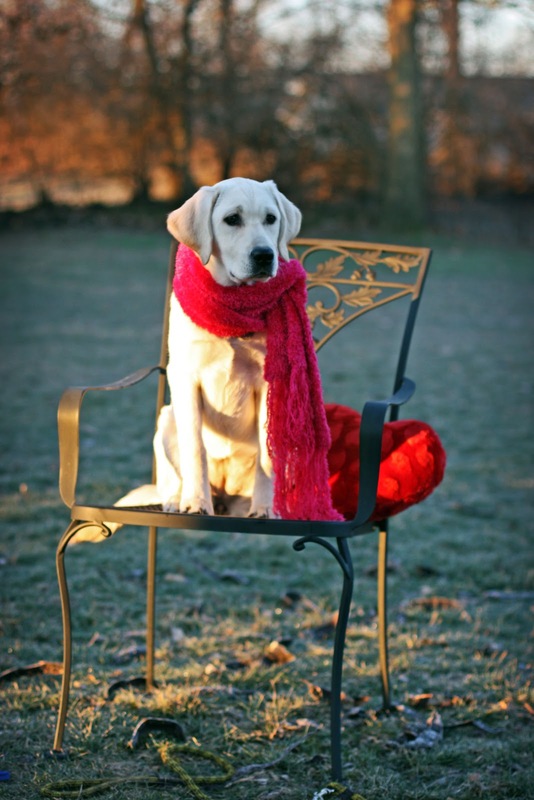 Single handed – by myself, y’all – I managed get the pup on the chair, next to a heart pillow and to wear a scarf long enough to get some photos. If I achieve nothing else with this puppy over the next year, I got this. Happy Valentines. What our humans will do for a great photo shot. You did a good job cute shot. Where did Euka's little puppy face go? She's looking like such a big girl all of the sudden! But still ever sooo cute! Dont stop the This article is really informative. I enjoy the amount of detail that has gone into this page. I will absolutely be a daily visitor from now on. great writing!